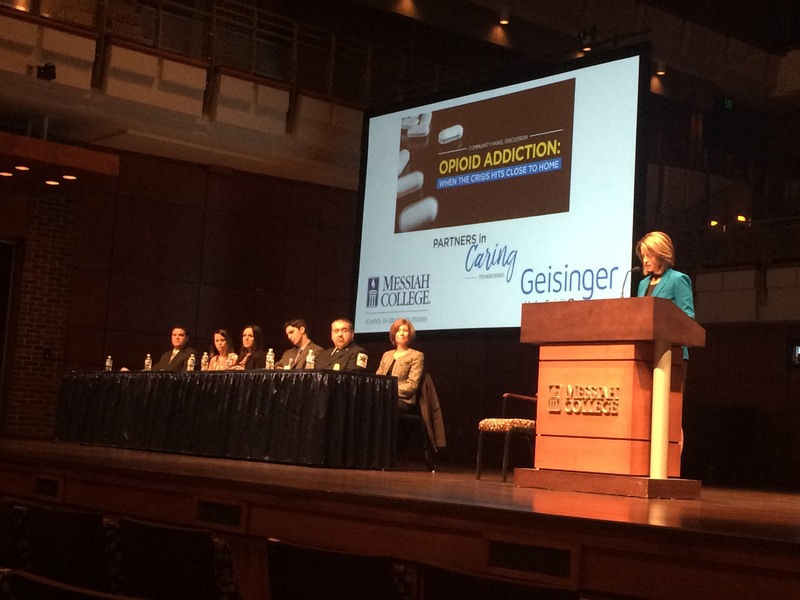 Geisinger Holy Spirit Medical Group and Messiah College School of Graduate Studies co-sponsored a vital discussion on Monday in Parmer, addressing the opioid epidemic in Pennsylvania. The diverse group of panelists included Carrie DeLone, Duane Nieves, Kristin Varner, Jordan Barbour, Leah Clark and Karl Bergmann. The panelists work in health-related fields at places such as Geisinger Holy Spirit Medical Group, the RASE Project and Messiah Undergrad and Graduate programs. Over-prescribing opioids has led to opioid overdose, which is one of the main contributors to the overall problem, said Barbour. Every county in Pennsylvania needs to be aware of their local “Take-Back” program, Barbour continued. Kristin Varner, director of Carlisle programs and training and advocacy of the RASE Project, has been in long-term recovery since 2005. However, she is not the only one, as 23.5 million people in the U.S are also in long-term recovery, Varner explained. “I did not decide to be an addict,” Varner said. Varner was not aware of the genetic predisposition she had when she smoked marijuana and drank alcohol. The addiction progressed from there. Today she is a mother of three children and has a successful career. Addiction is a lifestyle disease; drugs are simply a symptom of this disease. “It [addiction] is anything we use to get out of ourselves so we don’t have to use healthy coping skills,” Varner said. Recovery capital, which includes everything that keeps you engaged in the recovery process, is something we take for granted, Varner continued. Simple advantages like transportation, child care, loving and supportive family are recovery capital that will increase chances of recovery for people with addictions. As for other treatments of opioid addiction, services such as counseling and physical therapy were discussed by Leah Clark, associate professor of counseling and Karl Bergmann, assistant director of the Messiah College Graduate Program. When it comes to counselors, if the treatment model does not work, Clark encourages her students to change the model. As people facing addiction are very vulnerable, she reminds counselors to be mindful of the clients. “We have to be humble enough to say it’s about the client and their treatment, not what I think is right, but what I think will work,” Clark said. Bergmann played a testimonial video clip to remind the public of the role physical therapy plays in addiction. Research has also shown that physical therapy is more effective than opioids, according to Bergmann. “The main goal of physical therapy is to return the patient to their lifestyle without medication or undergoing surgery,” he said. Ending the opioid epidemic means a much-needed collaboration between providers and professionals across the continuum of healthcare settings. Physical therapy was stated to be an essential element in this multidisciplinary strategy.